We have been seeing a number of plants with symptoms of nutrient issues at the Plant Clinic so far this spring. Most of these have come from plants that were started early in basements and greenhouses. Symptoms such as interveinal chlorosis (yellowing) or necrosis (brown tissue death) can often indicate a nutrient problem. In strawberries, a red or brown diffuse discoloration and necrosis across the leaves can also indicate a nutrient deficiency. There are several potential causes of these nutrient issues. The first, most obvious possibility, is that the soil or potting medium the plants are rooted in is deficient in an essential nutrient. Most commercial potting mixes contain sufficient nutrients for most plants, though this does not remove the need for fertilizing through the season. Soil testing on a regular basis can be helpful for gardens with heavy demands (a high-production vegetable garden, for example) while more infrequent testing is usually sufficient for areas that need less input (often perennials and easy-care annuals). Another potential cause of nutrient deficiency is if the soil pH is too far from neutral (7.0). While some plants require more acidic conditions, most plants grow well in soils with a pH of 6.0-7.0. If the soil is too acidic (low pH) or too alkaline or basic (high pH), nutrients may be bound to soil particles and be unavailable to the plant. For this reason, we always suggest a simple soil pH test when nutrient issues are suspected since there is no benefit to adding a nutrient to a soil if the underlying problem is that the nutrient cannot be used by the plant. The pH will have to be adjusted before adding any additional nutrients (and often simply adjusting the pH is enough by itself!). The last common cause of nutrient deficiency symptoms is root dysfunction. This can include root rots, root damage, girdling roots, or anything that could disrupt the ability of the plant to uptake nutrients from the soil. This may be associated with wilting since the plant may also have a difficult time absorbing water, but not always. We recommend carefully inspecting plants before installation to ensure a healthy root system. If a plant is pot-bound and the roots are beginning to grow in circle, cut the circling roots. If a root has started to girdle the base of the plant, cut the root (or return the plant if you notice this issue at planting). Keep in mind that nutrient toxicity resulting in too much of a specific nutrient can also cause plant injury. This is another reason why we recommend testing the soil before adding large amounts of fertilizer, especially if the fertilizer is heavy in one or two specific nutrients. For most situations, a fairly balanced, complete fertilizer will be sufficient baring any of the problems discussed above. Classic symptoms of nutrient chlorosis on red maple. Note the chlorotic (yellow) tissue with dark green veins displayed on the leaf on the left. On the right, the condition has persisted and necrotic (brown, dead) tissue has developed between the veins. 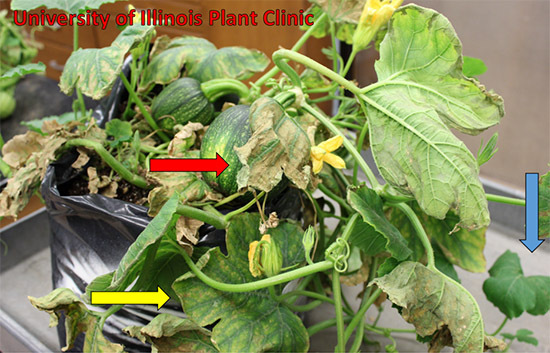 A recent pumpkin sample submitted to the University of Illinois Plant Clinic. No pathogens or insect pests were found on the sample. Symptoms of nutrient deficiency or toxicity were noted on this sample: chlorotic interveinal tissue (yellow arrow) and necrotic interveinal tissue (red arrow). 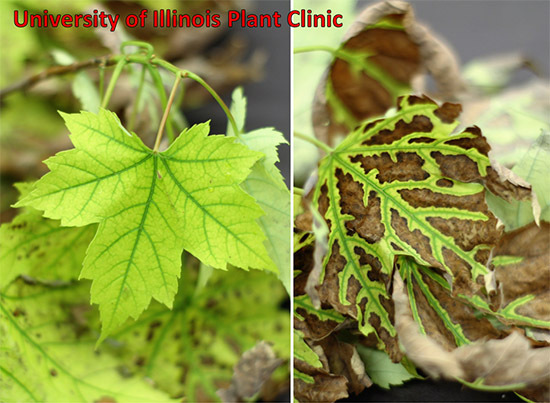 Note that the symptoms were more advanced on older leaves; new leaves appeared healthy (blue arrow).